After two-week break for Easter, TLFG is back. How was the festive period for you? Did you manage a groundhop triple on Easter Monday or visit any grounds for the first time? As I mentioned, I had to work the entire four-day weekend so didn't get to see anything then. I've also been away visiting relatives and working late shifts so I finally got my chance earlier today (Sunday). 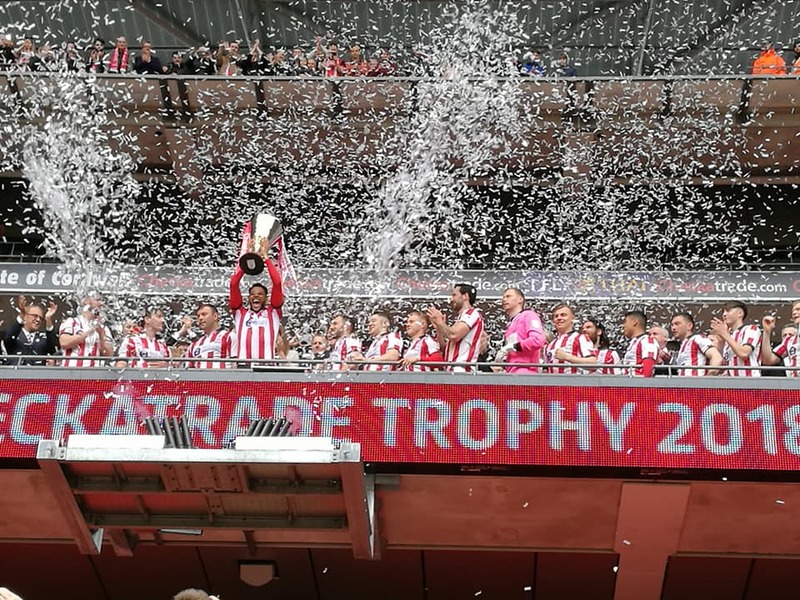 After several years partnering with Prostate Cancer UK on Non-League Day, I was very lucky to receive an invitation to the EFL Trophy Final at Wembley between Lincoln City and Shrewsbury Town. 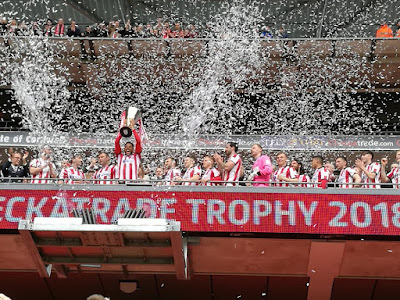 Traditionally contested by sides in League One and League Two, the last couple of seasons have seen the controversial introduction of U21 sides from Premier League and Championship clubs too. Thankfully no academy sides have yet made it to Wembley so today's game was significant for both competing clubs. With Lincoln playing a division below the Shrews, they started as underdogs but roared on by a larger following they took a 16th-minute lead which they ultimately never relinquished. As well as getting a ticket to the game, I was also treated to full hospitality in the Bobby Moore Room which was quite an experience. Treated like five-star guests, we enjoyed a three-course meal before kick-off, tea and coffee at half-time and afternoon tea following the game. The seats on the half-way line, just behind the dugouts, were amazing and we could have touched the players as they made their way to and from the royal box to pick up the trophy at the end. I was also seated alongside representatives from Altrincham, Brentford and National League sponsors Vanarama so there were some interesting discussions too. As a new member of the prawn-sandwich brigade, I can see how watching a game in this way can really appeal and I could get used to it but the formality/dress codes etc could get a bit stifling - definitely best as a once in a while treat. 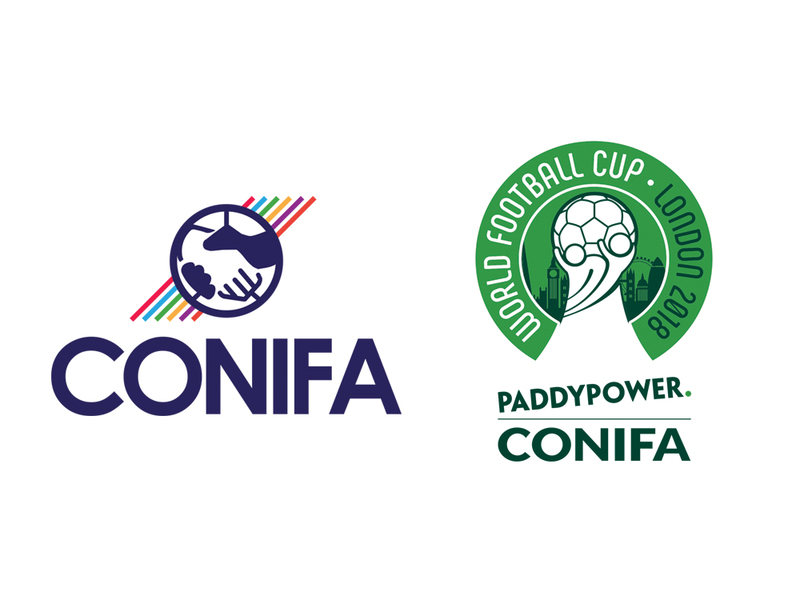 We've now got a pretty clear idea of all the venues except the one for the final which is being kept under wraps - it surely can't be much longer though. There's also a game taking place between two Conifa members on Sunday when Barawa play Yorkshire at Haringey Borough's ground. Yorkshire only formed a team a few months ago and this will be their first ever away game so it's an historic occasion. Held over from a couple of weeks ago, our intrepid duo went to Imperial Fields to see Dulwich Hamlet play their first league game following the, hopefully, temporary move to share with Tooting & Mitcham United. Lastly this week I'd like to thank Rod S from the USA for another generous donation to TLFG's coffee-drinking fund - it's very much appreciated, I hope you enjoyed your visit to Crystal Palace. There are over 100 matches in the London area over the next seven days. The highlights include some big games in the Premier League, EFL and National League and there also a number of minor cup finals too.